Giorgio Armani Ecstasy Lacquers are a new makeup launch from the brand and feature a formula that combines the lacquered shine of a lipgloss, comfort of a lipstick, and the lasting power of a stain. It's innovative technology packs a high concentration of water-soluble pigments to give these lacquer lipglosses vivid color and a long wear time. The Ecstasy Lacquers also contain glycerin that helps with easy smooth application and keeps lips hydrated. Because these lipglosses are so concentrated in color pigments, you can either apply them for a sheer effect by dabbing a small amount on the lips and blending it or build up several coats for richer coverage. Add extra gloss over the center of lower lip for the perfect glossy pout. 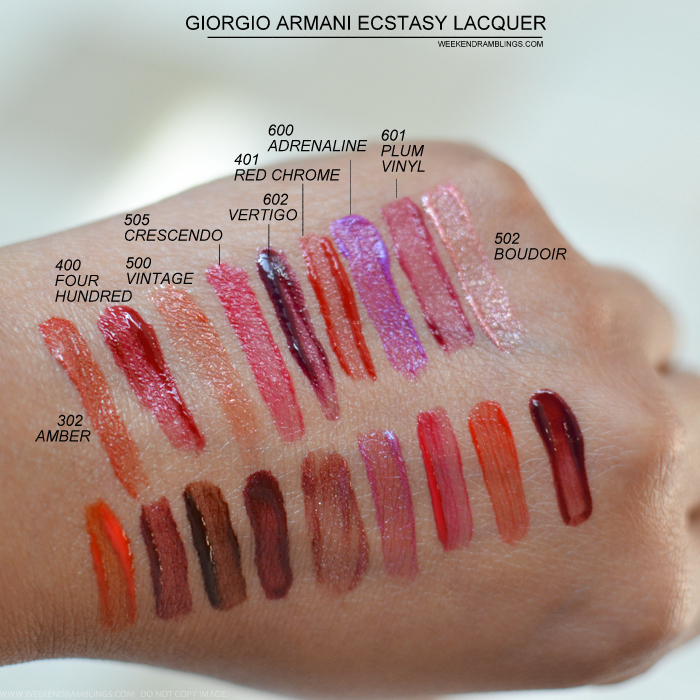 Scroll on for swatches of the Giorgio Armani Ecstasy Lacquer lipglosses. These are available in 18 shades of 10 are pure lacquer shades (201 Leather, 400 Four Hundred, 401 Red Chrome, 402 Red-to-Go, 300 Tangerine, 601 Plum Vinyl, 602 Vertigo, 505 Crescendo, 501 Uptown, 603 Night Viper) and 8 have a pearl effect to them (200 Night Berry, 302 Amber, 500 Vintage, 502 Budoir, 503 Fatale, 504 Pink-Out, 506 Maharajah, 600 Adrenaline). I have always loved the glossy shine and easy wearability of lipglosses, so the Giorgio Armani Ecstasy Lacquers are an easy favorite with me. The formula seems similar to the Make Up For Ever Artist Plexi-Gloss, though the Giorgio Armani Ecstasy Lacquers do seem a lot more long lasting. I tried these glosses on my hand for swatches, and I found it quite difficult to get the stains off my hand. I love the packaging and the formula of these lip lacquers. The original packaging features a flocked applicator, but the testers at the counter had those removed (usual with gloss testers), and the swatches in the photos below were applied using disposable lip brushes, so some of the swatches might appear sheerer than the others. These can be used on their own, either as a sheer layer for a glossy stain effect or build up for darker color, or layered over a lipstick or lipliner for long-lasting glossy color and shine with opaque coverage. There are some beautiful colors in the range and quite a bit of vampy dark colors and reds that are classic fall shades. While I always admire these sort of rich fall colors on others, my picks from the Giorgio Armani Ecstasy Lacquer range would have to be the easier to wear and fun colors like Crescendo and Plum Vinyl. 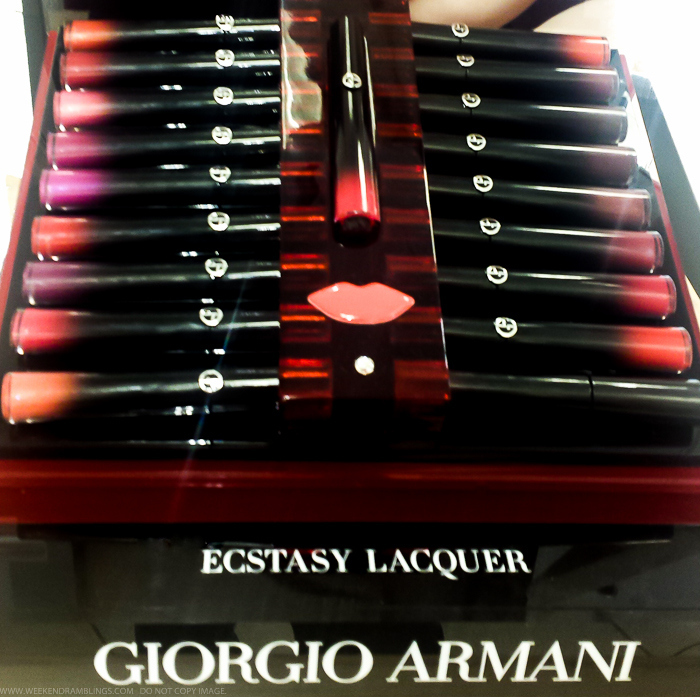 Giorgio Armani Ecstasy Lacquers would be the perfect pick for someone who likes a rich glossy lip that stays put through the night. These are STUNNING! I love the dark shades and will likely pick up 200, 503 and 603! I'm really intrigued by these. 503 looks like a unique shade...I will try to resist these until either Sephora or GA have a sale, but I'm not sure I can wait that long! So you mention uptown, but you swatch crescendo twice! Any chance one of them is uptown? Thanks! Hi...I don't think Uptown was available for swatching...am pretty sure I have swatched Crescendo twice as labeled in the photos.